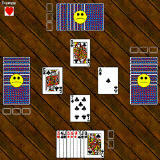 An easy to learn card game where you must guess how many tricks you are going to win each round. Niggle (also known as "Oh Hell") is an easy to learn card game where you must guess how many tricks you are going to win each round. The fun comes from trying to get exactly the number of wins you guessed while stopping your opponents from achieving their target. The AI plays a mean game and also shows you how confident or worried the computer players are that they will make their bids. Niggle is an easy to learn card game where you must guess how many tricks you are going to win each round. Cactus Cash - Mexico awaits your pokie pleasure - the Chili Feature will warm your winter nights! Cup Fever - Pick up the Racing Spirit with this hugely fun new game - try your luck at the races today! Pyramid Pays - Journey to ancient Egypt and say blessing to the Pharaoh!